Thanks to goldfish breeding there are now hundreds of varieties of goldfish on the market. Some are perfect for life in an aquarium where they will be more or less protected from predators and disease, while others are healthier and happier in an outdoor environment. The latter are the hardy varieties and can easily survive winter weather as long as the pond is deep enough not to freeze all the way to the bottom. This type of goldfish is the hardiest of all the varieties and is best able to survive in an outdoor environment. These grow to become very large fish, often achieving lengths of 12 to 18 inches. The common goldfish retains the same basic shape as its wild cousins but is more colorful. These fish swim fast, hide easily and compete well for food. 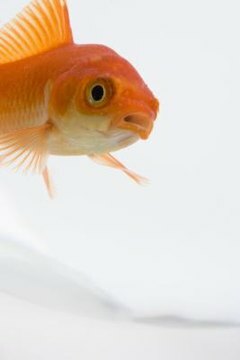 Common goldfish survive in near-freezing temperatures but tend to outgrow their aquarium homes quickly. Comets are often mistaken for common goldfish, as they look roughly the same except for body shape and tail length. These fish are aptly named due to their fast swimming speed and can be difficult to catch. Comets are longer and thinner than the common goldfish and many also have longer tails. They come in a variety of colors and are extremely hardy fish that are capable of withstanding near-freezing temperatures throughout the long winters. These are uniquely colored comet goldfish, often described as calico-colored or speckled. Sometimes they are called harlequin goldfish. Being comets, they are winter hardy and fast moving, able to avoid predation with ease. They grow extremely large, around 12 to 18 inches long, just like the common goldfish, and they make great pond fish. They also make popular aquarium pets due to their beautiful colorations but will require a very large tank to house them properly. One of the physical characteristics of the fantail goldfish is the "triple" tail, usually long and flowing, with the points joined at the top and separated at the bottom. The bellies of these fish are rounder and, while they are hardier than the hump-backed varieties, they are not as hardy as the commons, comets and shubunkins. These fish can survive easily in an aquarium environment but are not as well adapted to life in a pond.